**This post mentions several brands for the benefit of the reader. I was not compensated in any way for this post. It has been just over a week that OB and I moved into our little home on wheels. It has been a lot of work organizing our space, deciding what to keep, what to sell and what to toss. But, I am am so happy we made this choice! I love our little home! Everything as a spot, it’s easy to keep clean and it’s magically forced me into a better and more productive routine. If it were up to me, I would insist that everyone do this at least once in their life. I thought that since we are finally settled in it was time for me to give you a little tour of our home. 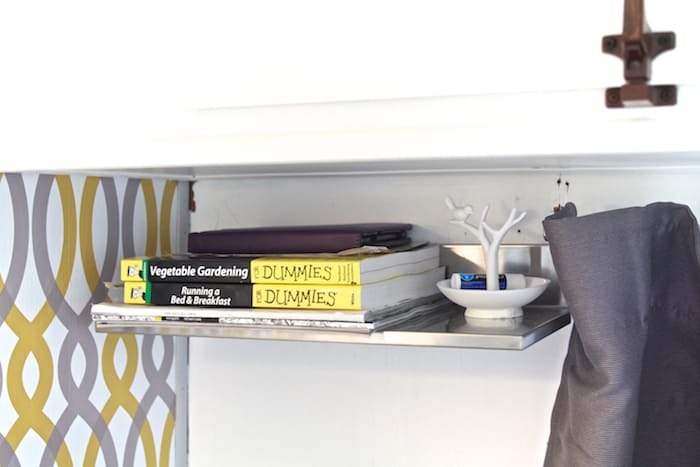 We made many small tweaks to optimize our small space and make it feel more like home. One of the first things I focused on was out outdoor space. Spending all day in a tiny house isn’t practical. It’s important to have a space to stretch out a bit and enjoy one of the great benefits of living a camper…the outdoors. This is just the beginning of our outdoor space. Soon we hope to have a vintage style yellow awning and a few more plants and accessories. 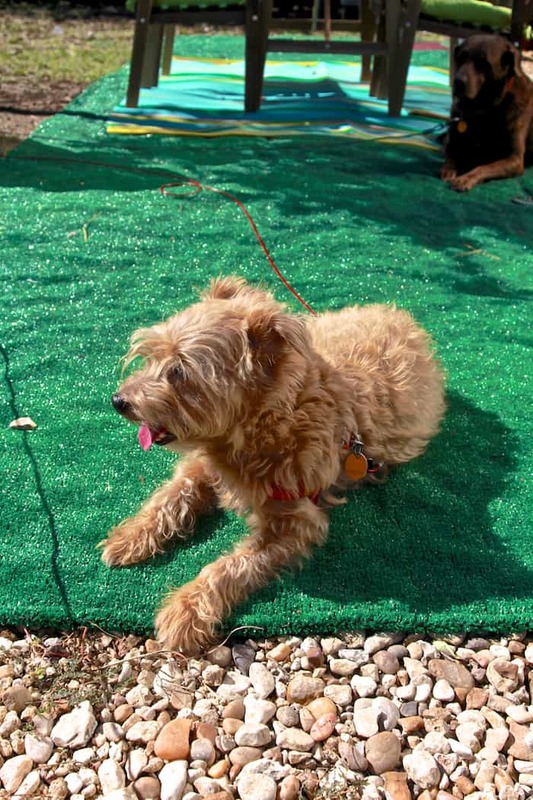 To help the control of dirty paws we got a large 8 x 20 green patio rug. I love my bright green faux grass rug! It gives it the perfect touch of fun vintage. 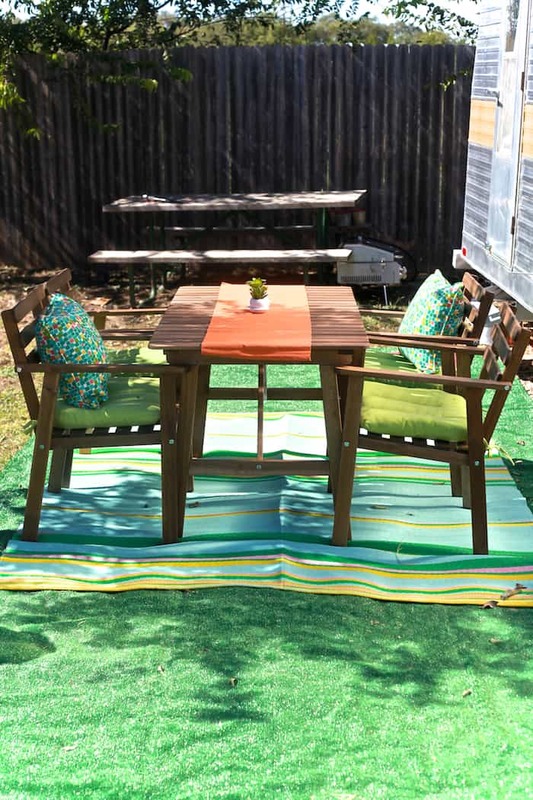 Then over the rug we put another outdoor rug to break up the green and give the patio set a focus point. The patio set is a simple wood patio set we got at IKEA. Super easy to put together and super inexpensive. (FYI, you’re going to see a lot of IKEA, but IKEA had nothing to do with this post.) The cushions are from At Home, and the runner is secured with some adhesive velcro strips. Open the door and the pups are right there to welcome us home. Step into the “dining/living” space. It was important to me to add some personal details and bring in a few pictures from home. We also changed out the curtains. We found some great curtain tracks that let us better hang the curtain all around the front windows with no gaps. The curtains now run all the way around the front windows providing us with optimal privacy. Because when those curtains are open, you can see everything! 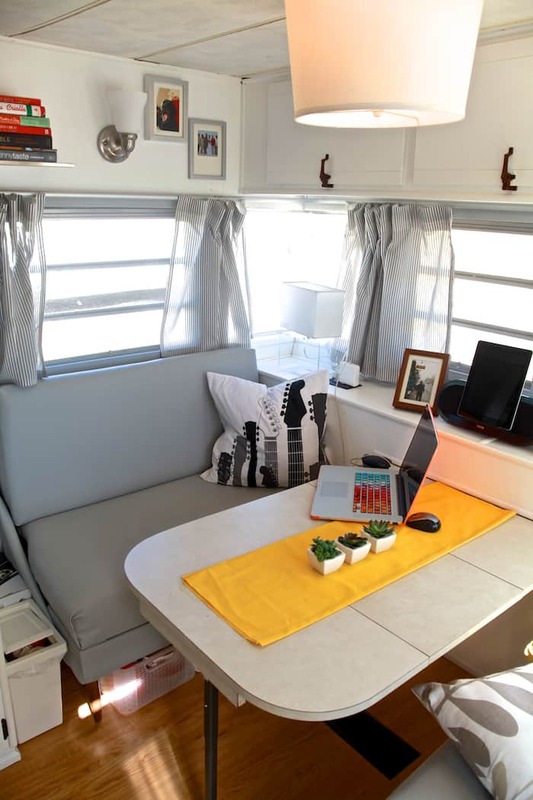 The studs in the camper are sparse so, hanging pictures and things were becoming a challenge. I found the best way to hang pictures and secure things like the lamp you see in the corner was using 3M Command hanging strips. These things are the bomb! On this wall, I was lucky enough to find a stud and hung a shelf for my must have on hand cookbooks, plus whichever new one I am reading at the time. It was important for me to have a few of my cookbooks on hand. 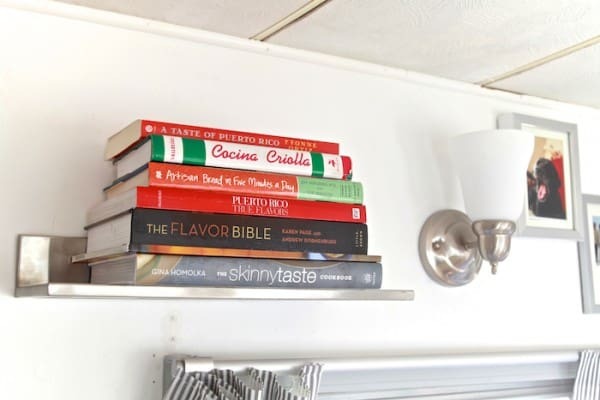 The rest of my cookbook collection is in a storage unit 1 minute away from the campground. Here is a shot of the other bench area. I kept it simple here with a few throw pillows and some personal touches on the wall. I wanted to bring in some greenery and hung some artificial plants on the wall thanks to the magic of 3M command strips. If you look at the back of the basket, you can just barely seem the strips. Under the benches, I have baskets storing my favorite dish and textile props. Also, under the bench seat is more storage space. There is where I store my backdrops, surfaces, platters, cutting boards and my induction burner. Here is a complete picture of the dining/living area. The cabinets above are where I keep some small kitchen appliances, collection of vinegars and oils and my heavy duty dutch ovens. Above the doorway we hung a picture shelf and some hanging hooks as an in and out station for keys, mail and whatever else you need on the way out the door. On the wall next to the door, which contains the refrigerator, I hung some pots and pans that I wanted to have quick access to. This wall is not really a wall; it’s just a framed in panel. 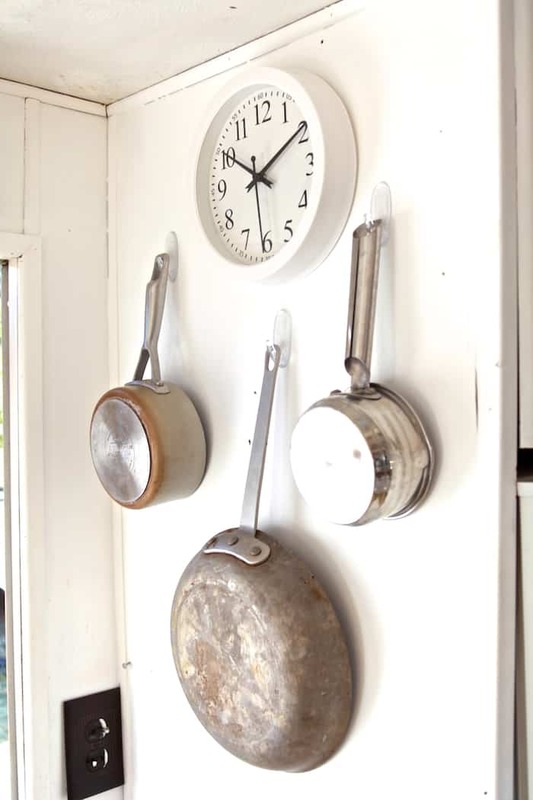 It has no studs behind it so, again I used the 3M Command hooks to hang the pots, pan and clock. Let’s take half a step and move into the kitchen. In order to optimize my counter space I got this cutting board that fits over the range and can also be placed over the sink when I am using the range. It’s perfect! Across from the range is the refrigerator/spice rack. My spice collection is extensive, and if I stored it in the pantry, I would barely have any room for food. 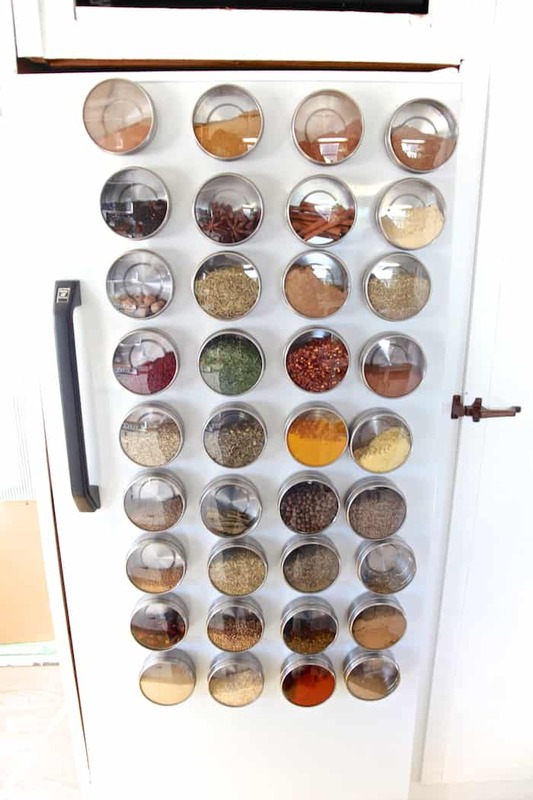 I filled 36 magnetic spice containers and put them on the refrigerator. It’s perfect really! I was looking for a way to dress up the refrigerator, and this was the perfect solution. 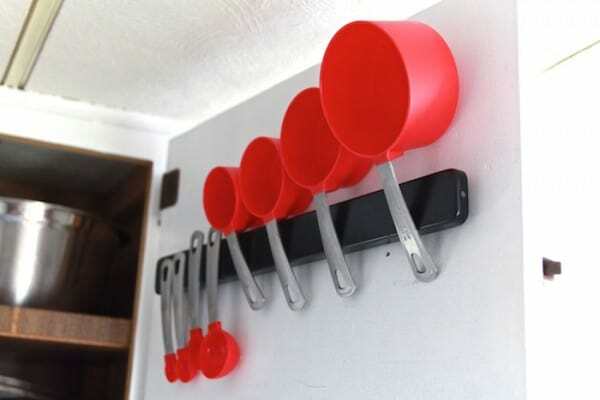 On the kitchen wall is another magnetic strip for my knives and a rod to hang cooking utensils and a dish drying rack. 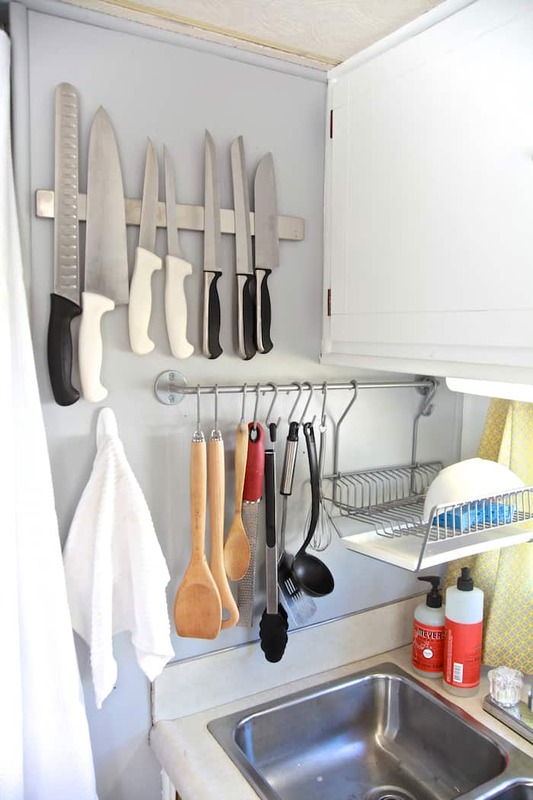 Hanging the dish rack on the wall leaves both my sinks open for cleaning dishes or prepping foods. Another change we made in the kitchen was installing a gooseneck faucet. This has made a huge difference when cleaning dishes. It allows more space to rinse large items like pots and pans. 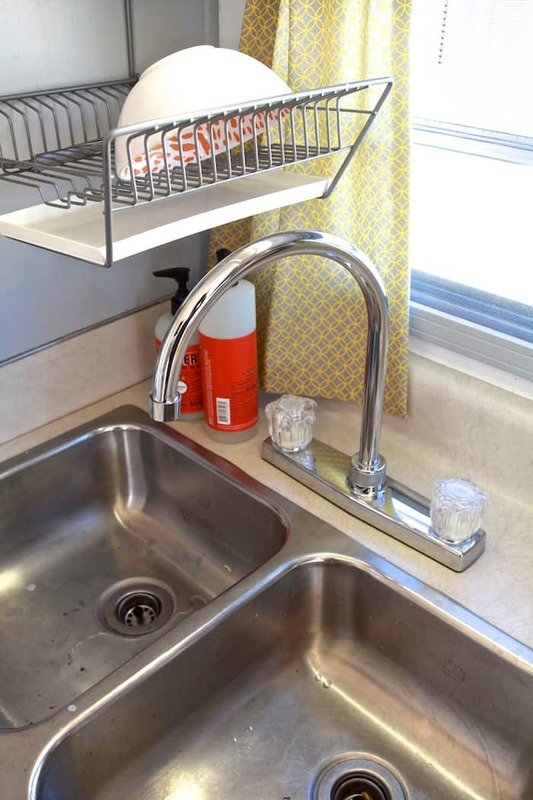 Every camper should have a gooseneck faucet! Now let us turn to the left and enter the bedroom. First you will notice the wall. Before I had a decal of a tree but, it started to peel off and look dirty. It was driving me crazy! While strolling the aisles of target I found this vinyl temporary wallpaper. PERFECT! It was easy to apply, and if I get tired of it, it will be easy to change. I also changed the bedding to a duvet cover so I can change our the weight of the comforter depending on the weather. In the cabinets above the bed, I have more bedding and blankets. The light fixture was also presenting to be a challenge. It’s the original fixture, and each light has its own switch. I wanted to find something familiar to replace it but, I couldn’t find any fixtures with dual switches. Instead, I fixed it with smaller bulbs and found these little shades that sit directly on the bulb. Perfect solution! We also changed the curtains out in this space with heavy blackout curtains that I hemmed. These curtains help keep out the morning light and cold air. Over the bed and just under the cabinets we hung some more bookshelves to use as nightstands. This way I don’t have to climb over OB to get my cellphone or my glasses. Do you like my reading material? On the opposite wall, we hung our little tv. 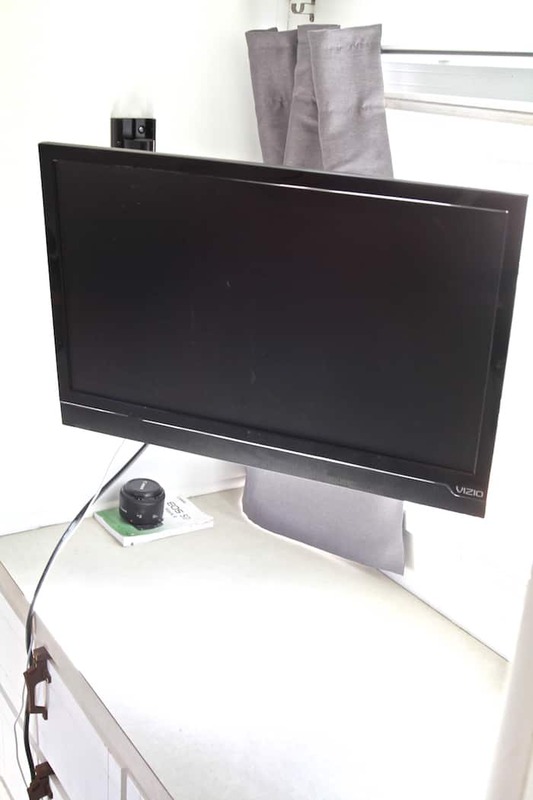 It’s on an arm that pulls out so we can watch tv from the kitchen/dining area or the bedroom. I can even see the tv from the bathroom. 🙂 We still need to fix the cable situation and run it through the floor of the camper. 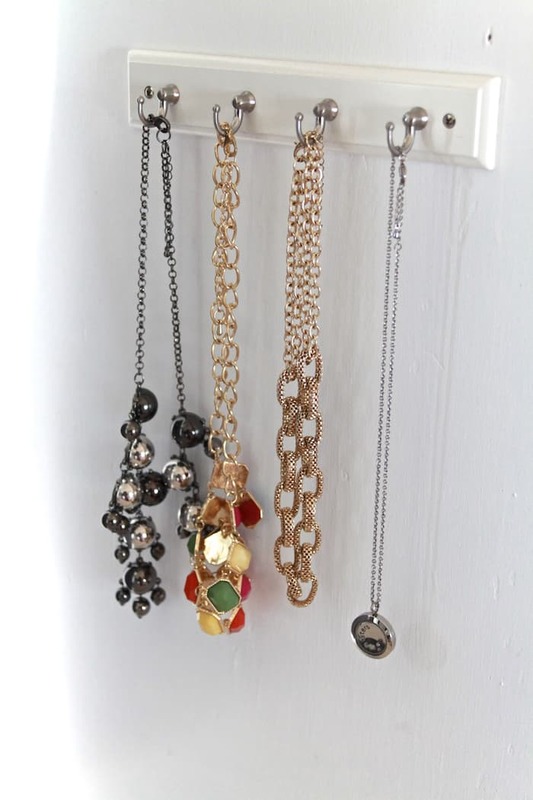 On the other wall of the vanity area, we hung some hooks for easy access to my favorite accessories. 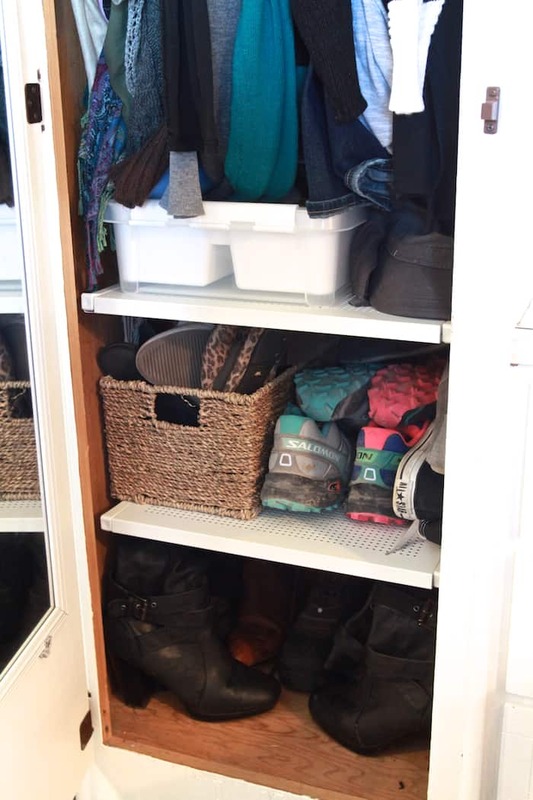 In the closest we installed some shelves to optimize storage space for our shoes. Also, I keep all my flats and sandals in the basket, leaving room for my boots and sneakers. Take two steps to the right, and we enter the master bath. 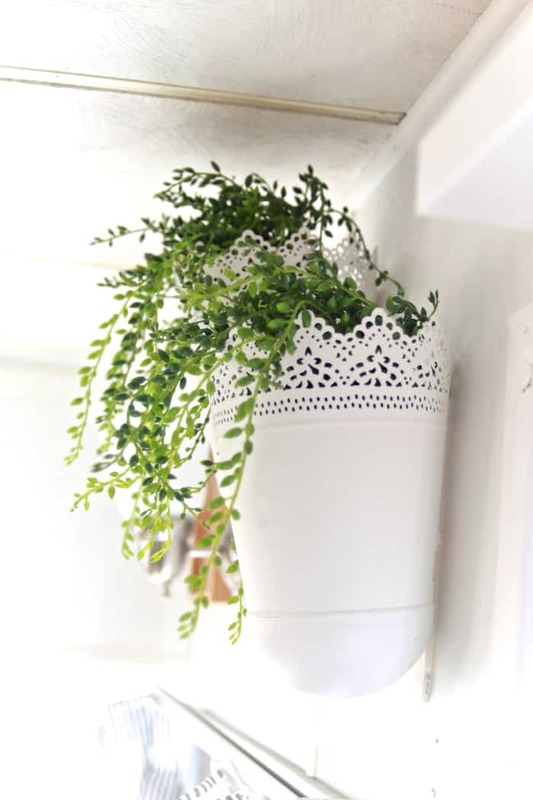 😉 Over the sink we hung a rod and some little baskets to hold our everyday items. Also, note another gooseneck faucet, a necessity to wet my crazy short hair in the morning. In the bathroom is a backdoor area that we have converted into a storage area. On the wall we hung some baskets. The top basket holds my hair dryer and hair iron and the bottom basket has all the doggie items. We also have a rod to hang our coats. 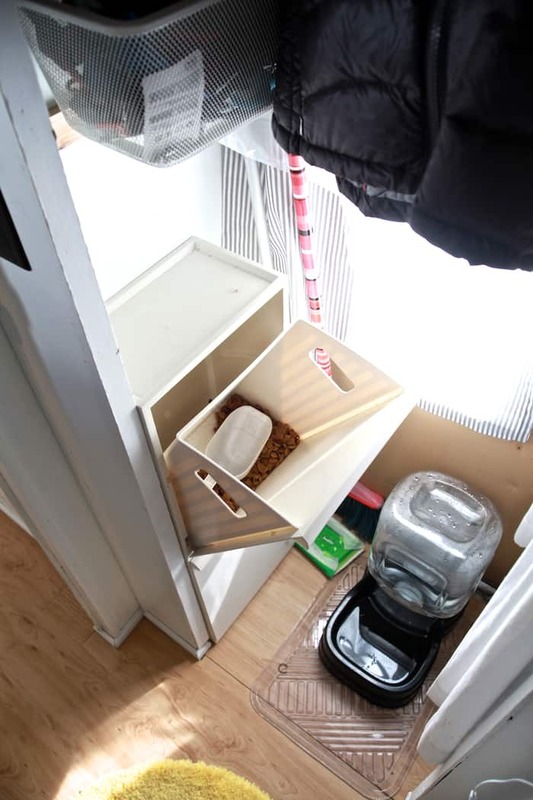 At the bottom are some containers to hold the dog food and a water dispenser for the pups. And, that is our little home! There have been some adjustments and challenges. 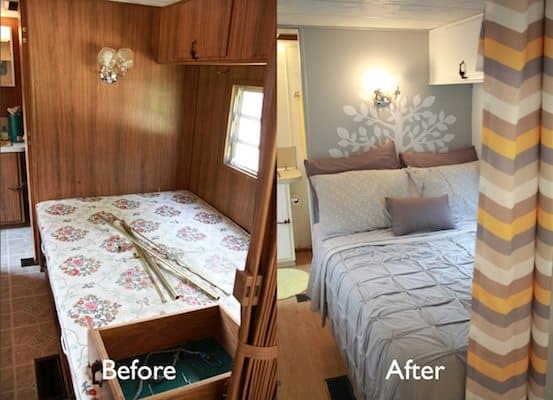 It’s a big change going from a 1900 square foot house to a tiny trailer. But, so far I am in love with our little home. We get up together early in the morning and walk the dogs with a hot thermos of coffee in hand. In the evenings we light the chiminea and enjoy dinner and conversation outside. Our next step is soon to begin the hunt for the perfect piece of land. It’s not going to be easy, but I am confident it is out there somewhere. I will continue to keep you posted on our plans and experiences as we continue to dream small. Please feel free to ask any questions! I will do my best to answer them. So cute! Where did you get the fabric for the striped curtains? Love them! I got those at IKEA. They come really long so you have to hem them but, you can use the extra fabric on another project. I love what you have done. I would like to ask how you painted the window frames. Mine are black and they sweat a lot during the fall/winter. Did you just use the same primer or something different. I painted and wallpapered the living area about 10 years ago and now it needs a new update so I am going through the entire 5th wheel now and painting every wood *(fake and real) surface. I do the majority of it when camping on weekends so I can’t spray but if I need to spray paint the frames I could tape them off etc. before I start the walls. I was lucky because my window frames were already white. I do know that there are some spray paints that do well on metal. I know that could be a nightmare to do in such a small space but, it may be possible if well ventilated and lots of paper to catch overspray. 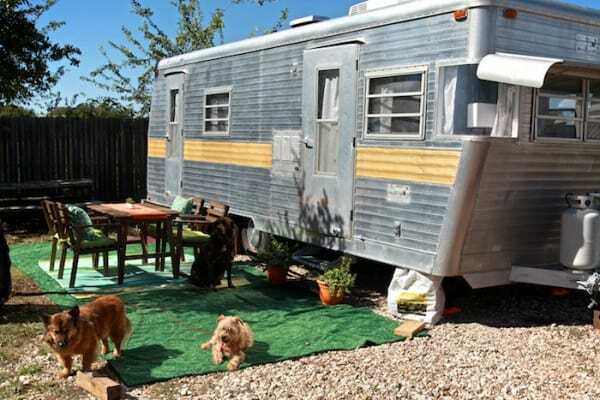 I live fulltime in a 30ft travel trailer in a small delightful park in Florida and I have a permanent address there as well. I purged so much that I hardly remember what I got rid of! It gives me a sense of freedom to not have so much “stuff”. Before he passed, my hubby tore out the bunk room and made a second small pantry area plus a closet area. 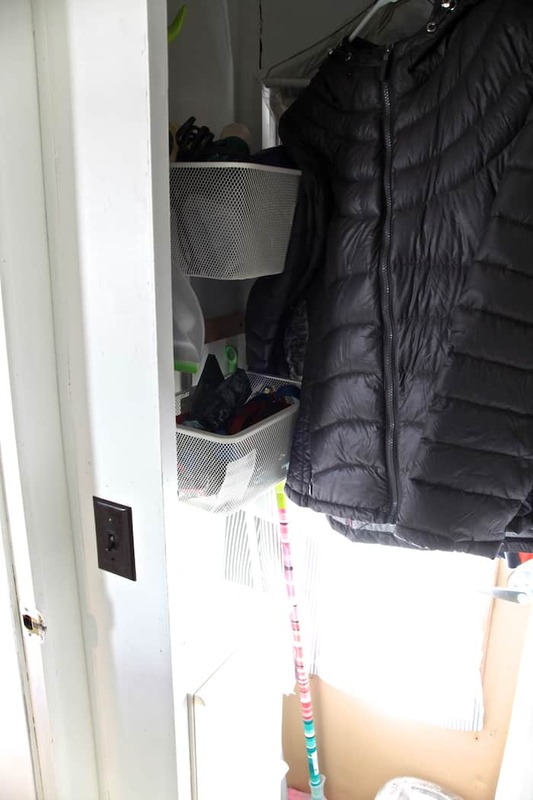 He even put in a file cabinet on the small shelf that covers the plumbing/pump. I use the small wardrobe that is in the bunk room for my mixer and extras I don’t use often. It’s a tiny home with a big heart and I love it. It’s also a work in progress as I figure out ways to personalize it and that is the challenging part as I am on a strict budget. I am gradually replacing dated things like built in valances as money permits. You have done a great job and given me ideas to use in my Aframe camper. I have had such fun decorating it and making it special and unique. Thanks for the added inspiration. Totally cute! What type of paint do you use on the interior walls? I absolutely love it. 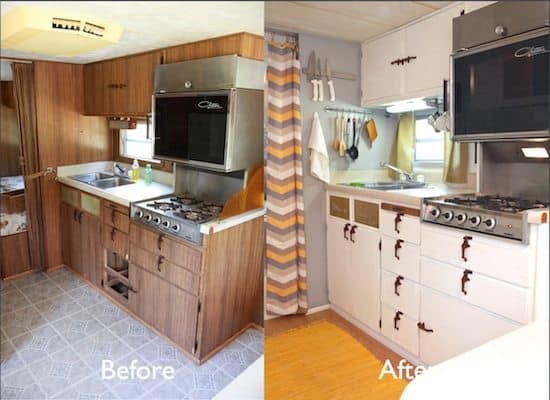 A Lot of thought and love went into this redo. Love how you utilized every space. Will be stealing some of your ideas when i finally get my trailer hopefully before end of summer. 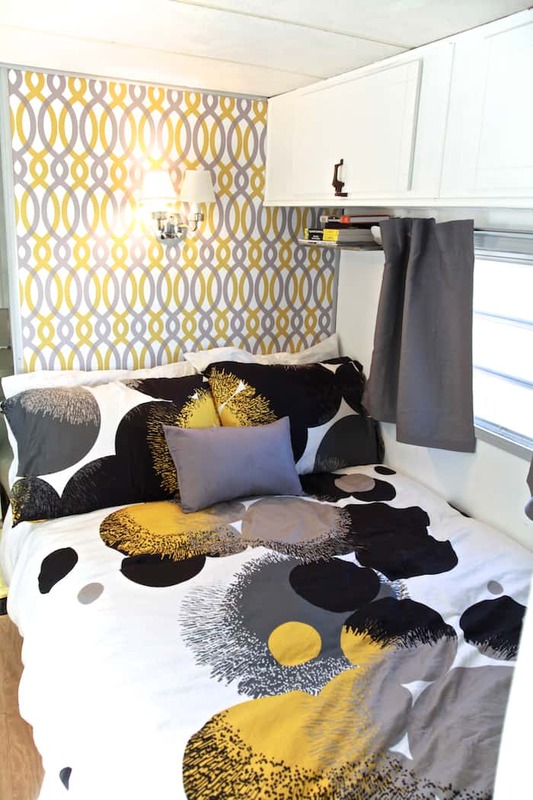 lovely, lovely job on your compact home !!! Where did you find your curtain rods? We are finishing up our camper project and I’ve had a hard time finding the right size rods. Ended up with the metal ones but they are not my favorite. We downsized into a small camper about 5 years ago when kids were grown and gone and haven’t looked back! We didn’t store anything. After about a year of unloading, everything we owned fit into our camper, including our two cats. 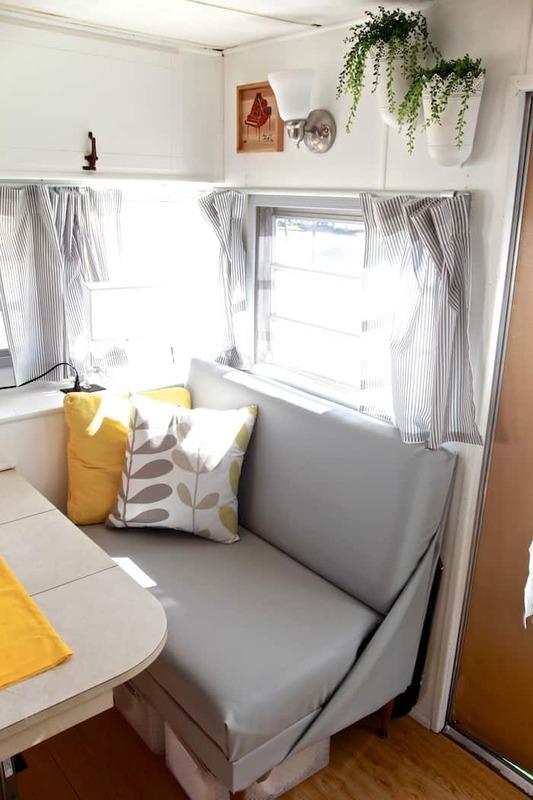 I did what you did to our camper, painted the inside white but I sponged it with light beige. It was originally just like your’s, that same common fake wood. Far too dark (and dated) for the small space. We moved to British Columbia, the only province in Canada that will allow us to use a campground/RV park as a permanent address and it’s warm enough to live in our camper all year long. 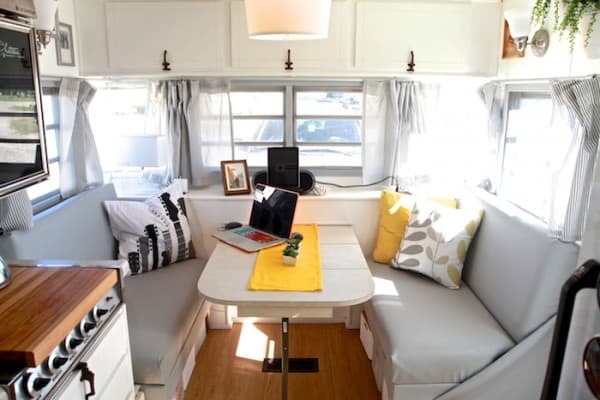 We love the small, minimizing lifestyle! May I make a small suggestion….? I noticed you have a chipped yellow bath sink…..you could buy a matching nail polish and touch up that chip. I did that on my kitchen sink, worked well. ?? Good job on trailer. Hey what kind of trailer is this? Fabulous! I am looking to do much the same in the year ahead. Can you post an estimated cost to date for purchase and renovations? Also, what did you (or do you if you plan on any traveling) haul it with, type of truck or? Please keep posting! Really inspiring! This is fabulous! Just fabulous! So creative and it must be cleansing to scale down. Do share more updates. I love the Spices like that on the fridge, great space saver… But lots of spices actually go bad from light/ heat getting to them. 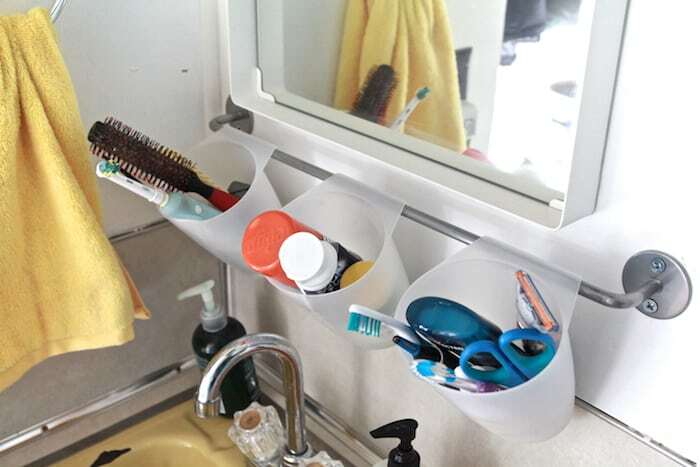 🙁 I hope they’re not getting bad from this awesome storage idea. I love this!! 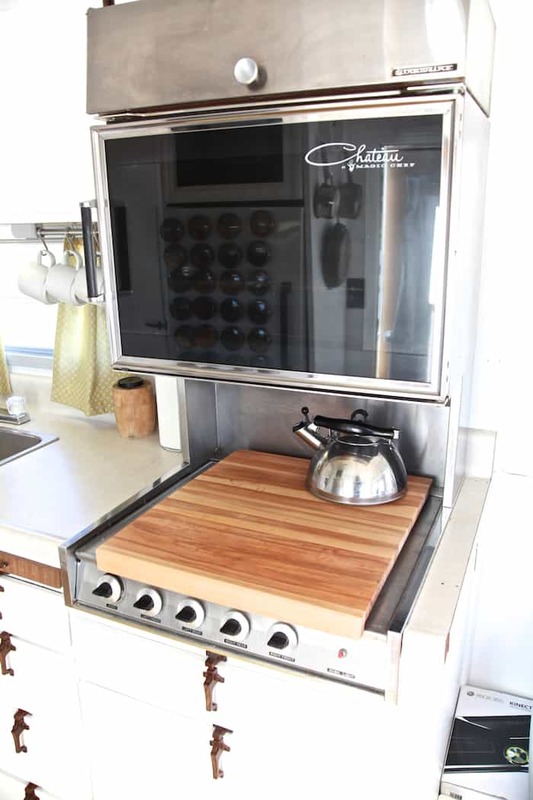 We have a 23ft 1973 Terry that has almost an identical layout, including that same Chateau stove!! Ours doesn’t have the back door though. 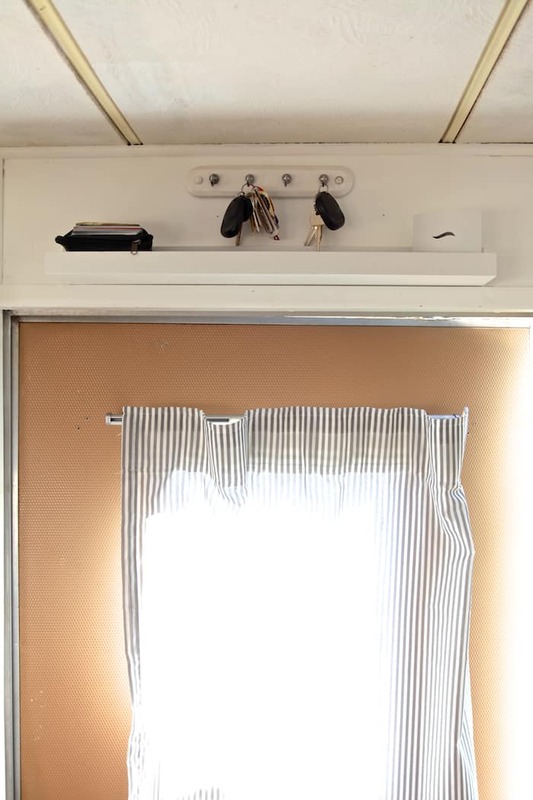 It was so fun to show husband what our little trailer could look like, thank you!! how did you get the light to work I want to put one over my table but dont know how to attatch it to ceiling? with it not being too heavy? Aw I can’t believe I hadn’t gotten around to reading this, I love how the sisters necklace is on your favorites lol ??? ?, your home is beautiful and you are so talented. Love you lady!! I really love your trailer and everything you have done with it. Do you know what kind of trailer it is? My husband loves it so much I think he is hoping to find one like it some day. Bang up job but did I miss the bathroom? I am with you. I feel we should all go through a similar process and declutter ourselves from things we don’t need. I know you are doing it for bigger and more exciting reasons but I bet a lot of good will come as a result of the efforts. All the best, it absolutely looks adorable and such an amazing experience. Un abrazo! I showed my husband your post and his response was “are we next?” He wants a tiny home so bad! 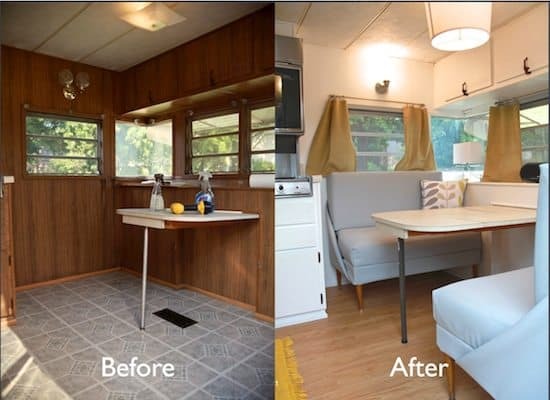 I thought that I loved your camper remodel before, but I absolutely adore what you’ve done to it to make it a full time home. Your clever use of space is inspiring! I am so jealous right now. 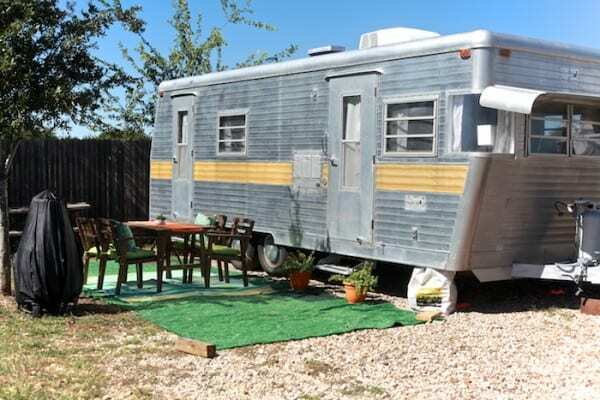 My hubs and I keep talking about buying an old camper and touring the country!! I absolutely LOVE what you have done with it, too!! I love the before and after pics. Seems like your kitchen is perfectly organized and well stacked (first thing I noticed lol) – congratulations!! Absolutely positively perfect! You did it, Meseidy!!! Everything looks great and you have made the best possible use of the space. I love the updated pics! Oh my goodness, I love what you’ve done with the place! It looks beautiful! I simply love this! You did such a fantastic job at making this your beautiful home. 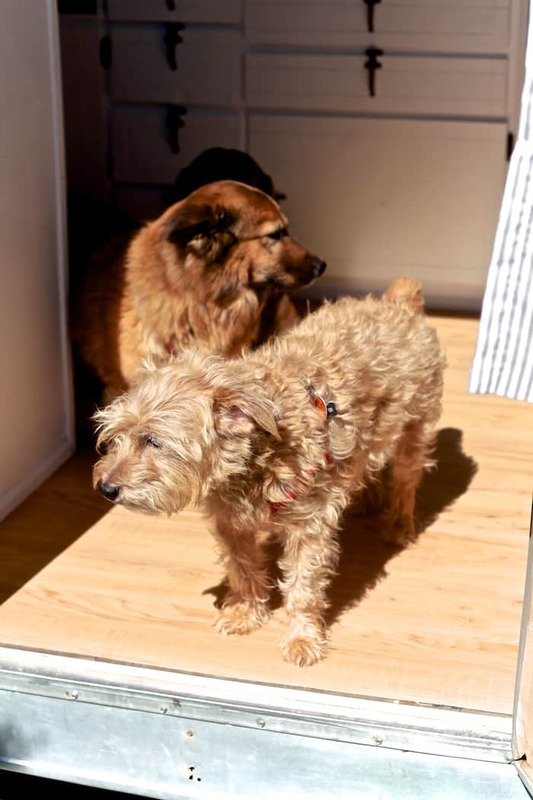 I lived in a 5th wheel trailer with my husband and 3 kids for 10 months while my husband traveled for work. It’s all about storage and optimizing what you have. I loved it, and I loved the freedom we had to just pick up and move whenever. Your house is beautiful!!! It’s beautiful! You did such a wonderful job! Wow – what a great transformation! Congratulations! Your new home looks amazing; I have very much enjoyed the before and after pictures. How long did the entire remodel take you? Will you guys also be traveling? I know I asked you that last time I saw you and I thought maybe you were going to go all over! Take care and tell OB hi from me! Im so impressed!! What a make over! Love all the ways you used the space creativley and functional! Thank you for posting this! You’ve totally changed my thoughts and associations on a camper. It looks fabulous! My husband and I are trying to live a simpler life as well but I don’t think I could get away with a camper since we have 2 kids under 3. I think your camper home is fabulous! I love how you decorated it & utilized the small space you have..excellent work! And by the way I absolutely LOVE your recipes! One question..do you have a shower or bath in the camper? If not then where do you & OB bathe? Just curious because my aunt wants to purchase a camper next summer.